The IMBUS-Advanced exam of the liver region is more than just looking at the gallbladder and bile ducts. 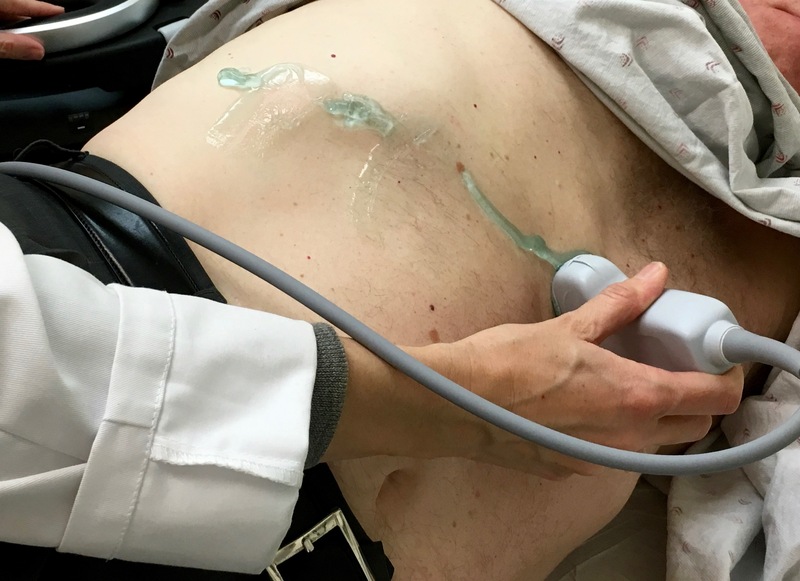 A clinic IMBUS exam of the liver region is most frequently requested for patients with subacute epigastric or right upper quadrant discomfort that suggests gallbladder (GB) disease. This exam may also be needed as part of the exam of systemically ill patients and patients with lab abnormalities suggesting hepatobiliary disease. Thus, it is important to learn to do a comprehensive, but efficient, exam that includes the liver parenchyma, hepatic veins (HV), portal veins (PV), hepatic ducts (HD), common bile duct (CBD), and gallbladder. The pancreas may be observed as part of this regional exam but it is covered two chapters after this. This chapter will discuss anatomy, technique, and normal findings while the next chapter will cover abnormal findings in the liver region. 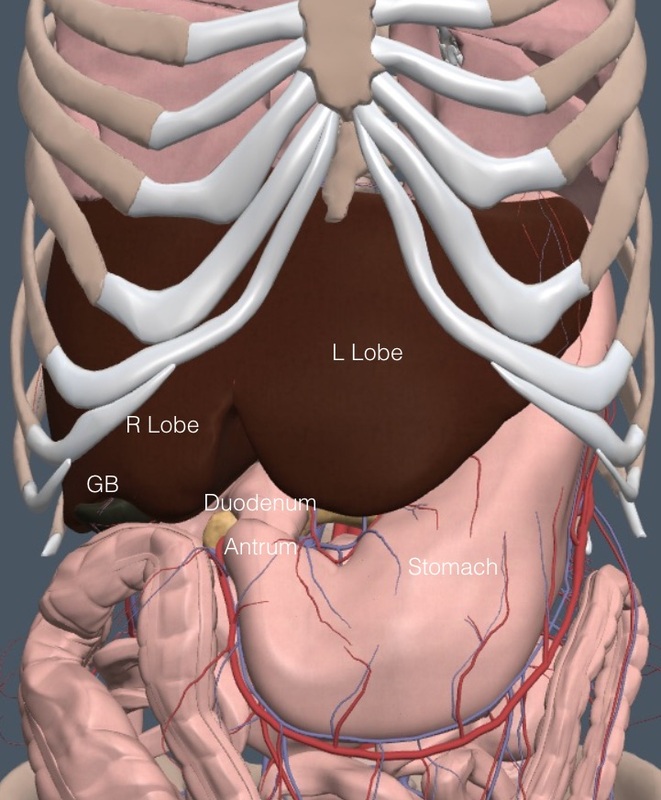 The following frontal anatomy view, with anterior structures removed, suggests that it should be easy to examine the liver and GB. Yet, when muscles, connective tissue, adipose tissue, and digestive tract contents are added the exam is more difficult. The standard radiology ultrasound exam is subcostal, but an intercostal approach is needed when the subcostal windows are suboptimal. 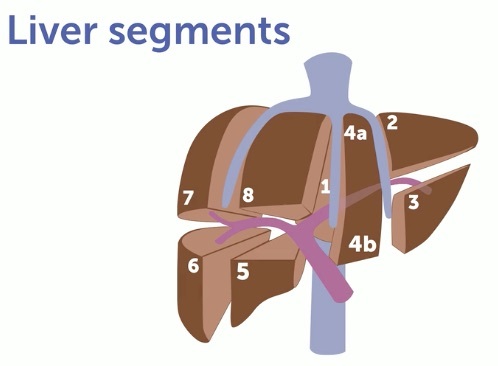 The liver is divided into functional segments based on the HV and PV divisions. The concept is simple and it is not necessary to know the segments by number. There are three HVs that drain cephalad to the IVC. The middle HV (MHV) divides the liver into the main right and left lobes and then the right and left HV (RHV, LHV) further divide each main lobe in half to create longitudinal quarters. This is shown schematically in the following diagram with the HVs in blue. The longitudinal quarters are divided in the transverse plane by the right and left PV (RPV, LPV), shown in purple in the diagram above. Ignoring the numbering system, it is enough for us to know we are viewing the “superior, medial portion of the right lobe”. 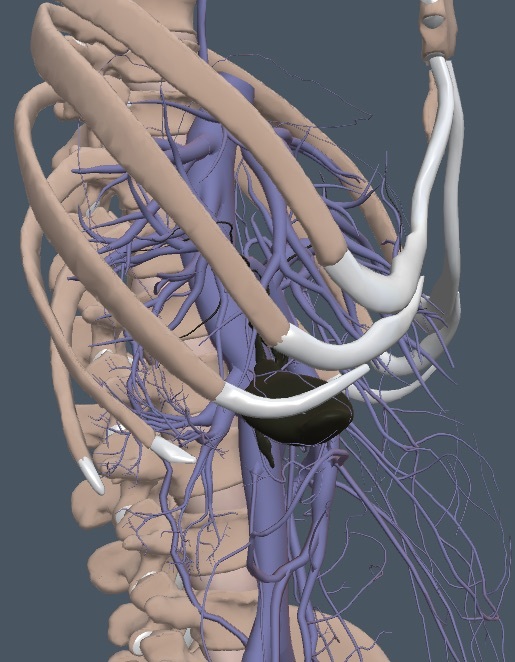 More detail of the vessel anatomy is shown in the following view as seen with the body turned about half way toward the left lateral decubitus position, close to an examiner’s view of a patient. There are two different RHV that drain the right liver lobe and enter the IVC more caudad than the MHV and the LHV. Thus, the HVs are often seen one or two at a time unless a particular oblique view is obtained, as in the following image, that gets the upper three HVs joining the IVC at the same time. Notice that the HVs have thin walls that are minimally hyperechoic. In contrast, portal veins have hyperechoic walls, except the extrahepatic beginning of the portal vein. The following clip shows the right portal vein with hyperechoic walls contrasting with several more anterior hepatic veins lacking these visible walls. The porta hepatis (PH) is a fissure on the inferior surface of the liver through which the neurovascular bundle and the bile ducts enter and exit. At the level of the PH there are still separate right and left HD which join further caudad to form the common HD. A little further caudad the common HD is joined by the cystic duct (rarely seen with IMBUS) to form the CBD. The CBD then runs in the hepatoduodenal ligament with the PV and the hepatic artery (HA) until it runs vertically through the head of the pancreas into the duodenum. The following frontal view diagram emphasizes the important relationships in this extra-hepatic region. The IVC is always the deepest, largest vessel. The PV runs oblique and anterior to the IVC. The CBD is anterior to the PV and runs more parallel to the IVC than it does to the PV. At the PH and inside the liver, the HDs remain anterior to the PV. The GB, cystic duct, HD, and CBD have anatomic variants that won’t be detailed here. But, the GB always lies on the inferior surface of the liver. Below is the most common anatomy, with the GB fundus peeking out below the inferior border of the right liver lobe. The GB body and neck then run obliquely posterior and medial on the inferior liver surface toward the pancreas and duodenum. 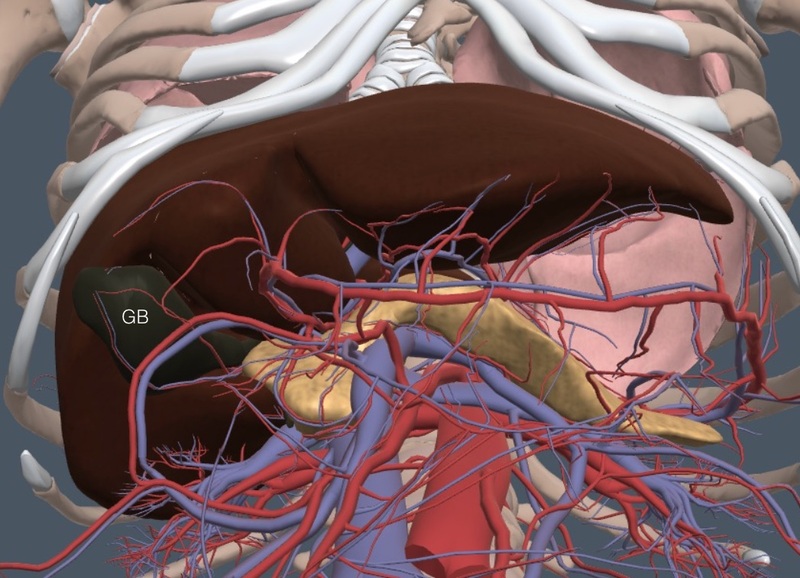 The next image shows the GB from a view looking up at the undersurface of the liver. The traditional radiology ultrasound exam includes a longitudinal and transverse subcostal sweep on a patient who has been fasting for 6 hours. Clinic patients infrequently have empty stomachs. Mindful of patient situations and exam time, the clinic exam is done with either a mostly transverse subcostal approach or with an intercostal approach if the subcostal window is suboptimal. 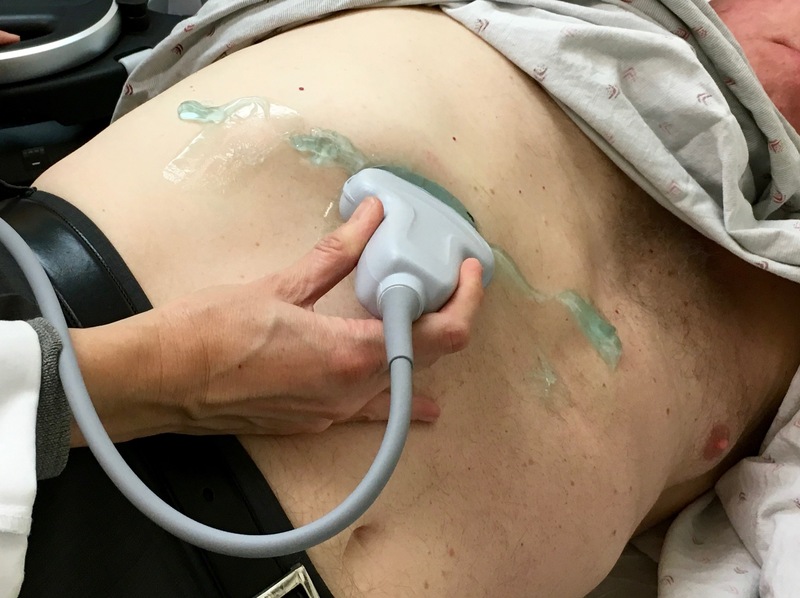 For either approach, use the curvilinear probe (indicator examiner left), left lateral patient position, and usually pre-applied gel. For the subcostal approach, held patient inspiration can improve the views but this is not helpful with the intercostal approach. Expert groups don’t agree on a particular measurement of liver size because the organ varies in shape and is dependent on patient size. As a European US course book puts it, “Liver size measurement has no impact in daily routine because there is no reliable and reproducible ultrasound method established so far.” There is agreement that a liver extending caudad of the right kidney is enlarged, as long as it isn’t just a downward elongation of an isolated lateral portion of the right lobe of the liver (Riedel variant). The caudad extension of the liver can be seen with either subcostal or intercostal views through the right liver lobe. Here is a clip of a longitudinal subcostal view showing extension of the liver below the right kidney, but this extension was isolated to the lateral right lobe so it was a Riedel variant. Another marker of hepatomegaly is a rounded longitudinal inferior edge of the left liver lobe instead of the normal acute angle. The following clip shows a normal acute angle. Begin in the high epigastric region. After a quick longitudinal view to see the angle of the inferior margin, move to a transverse probe position over the left lobe of the liver and fan anterior to posterior through the parenchyma. Here is the hand and probe positioning. After viewing the liver parenchyma, often including part of the left PV, look posterior to the liver for vessels (described two chapters ago). For this current chapter, the focus is only on the PV just after it is formed by the junction of the splenic vein and the superior mesenteric vein. The following clip nicely shows the PV anterior to the IVC as the splenic vein enters. Center and optimize the view of the PV and slowly rotate the indicator clockwise, usually to about the 10:00-11:00 position, so the PV and IVC are both moving toward long axis. Watch for the CBD to appear anterior to the PV. After glimpsing it, subtly rotate to get the best long axis view of the duct, which is often further toward the 12:00 position. This is the distal CBD as it is running into the head of the pancreas. The principle is that the CBD is always anterior to the PV but a little more parallel to the IVC. Here is a clip as the transverse probe was rotated clockwise. 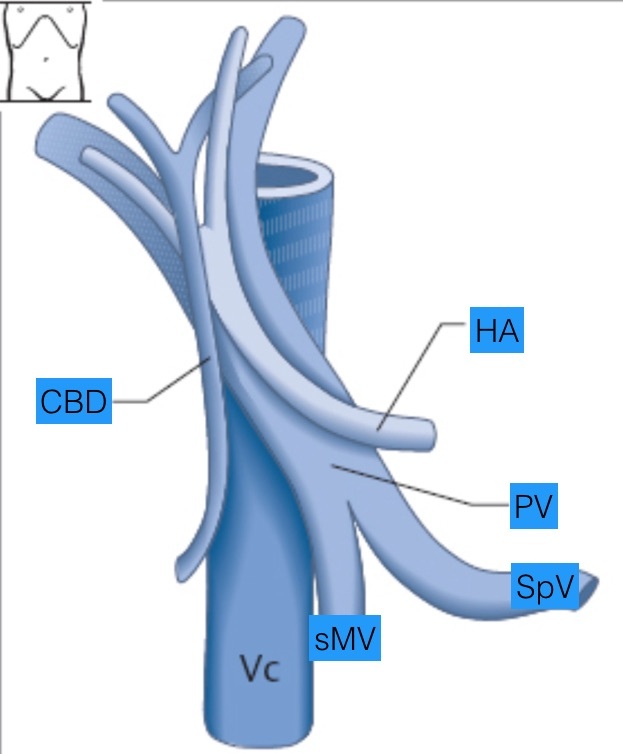 The IVC is the pulsating posterior vessel, the PV with its echogenic walls is anterior to the IVC and being moved by the IVC, the hepatic artery is the small round vessel indenting a little into the anterior wall of the PV, and the CBD is the thin, longitudinal structure anterior to the PV as it is entering the pancreas. It may be necessary to apply color flow Doppler (CF) to be sure that a supposed bile duct is non-vascular. Because the direction of flow for any structure doesn’t matter in this circumstance, it may be preferable to use power Doppler imaging. Here is an epigastric CF view of another patient. The probe was angled somewhat to the patient’s left, which moved the IVC on top of the vertebra with the aorta also moved to the patient’s left. The PV is anterior to the IVC and shifted to the patient’s left for a good view. Anterior to the PV the thin, non-vascular CBD is best seen as the IVC is more in its long axis. Normal CBD diameter is about 1 mm per decade of life after about age 40, but can be a little larger in post-cholecystectomy patients. Normal CBDs are thin and don’t need to be measured after a modest amount of eyeball training. Move the probe obliquely underneath the beginning of the right costal margin, indicator examiner left. 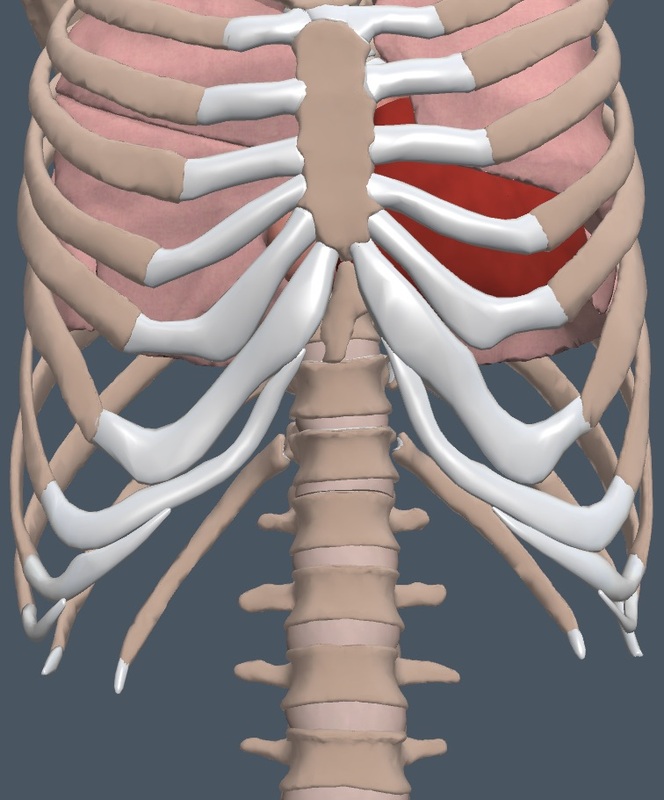 Angle as anterior as possible to see the diaphragm and then begin a slow posterior fan through the liver. The HVs will usually appear anteriorly as they join the IVC. Unless the oblique angle is perfect, the HVs will enter the IVC at slightly different locations, as in the following clip. Fanning a little posterior from the HV in the same location, an oblique or horizontal right PV should appear. Depending on the probe angle, this has been described as looking like a “deer (or other animal) jumping over the IVC toward the patient’s left”. Most of the animal is the long-axis PV with its hyperechoic walls. Because this view is higher in the liver near the PH, the HDs have not yet joined with the cystic duct to become the CBD so it is HD riding anterior to the animal. Subtly rotate the probe to optimize the HD. In the following clip, a very thin HD is seen anterior to the PV as the IVC becomes more in its long axis. Fanning posterior from the PV in the same location, the cross-sectional GB will often appear, seeming to come out of the tail of the deer/animal. It gets larger and then smaller as the posterior fan is completed. Gallstones can be observed in this cross sectional view and GB wall thickness (normal < 5 mm) may be well measured at the anterior wall that is interfacing with the liver. However, a contracted GB is not always easy to see. Here is a clip from the previous patient with the GB in cross section on the inferior surface of the liver after the angle was adjusted properly. Continue to slide the probe transversely underneath the right costal margin, fanning anterior and posterior through the liver parenchyma in each position. At some point, the fundus of the GB should appear at the inferior liver margin. Here is a typical subcostal probe position where the GB fundus might be seen. When the GB is glimpsed, rotate the probe slowly clockwise (indicator moving cephalad) until the best GB long axis is found. The most common anatomy would have the indicator pointing toward the 12:00-2:00 position. Below is a fasting patient with an excellent view of the GB in long axis. In this patient, the posterior IVC was in view when the GB was long axis and the PV was nicely in short axis, forming the classic “exclamation point”. The aorta is partly seen posterior to the IVC in this view. It is important for the first view of the GB to be deep enough to be able to see any shadows coming off of stones, particularly in the neck of the GB, where stones can hide. Fan through the long axis GB, often with magnification. A fasting GB is up to 10 cm in length and 4 cm in width. 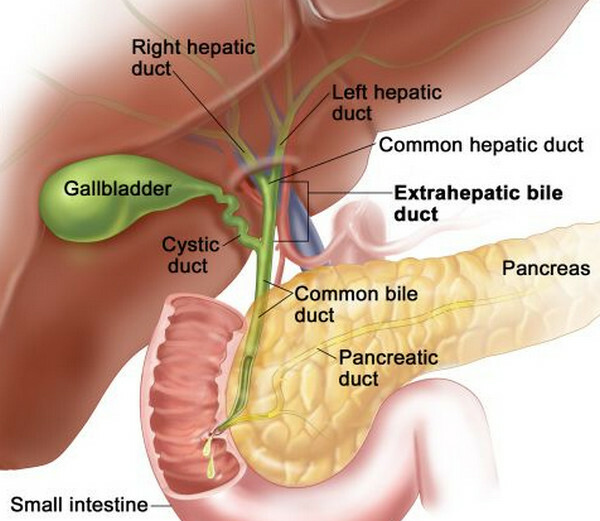 Bile ducts: A common teaching is that the long-axis GB and the short axis PV form an “exclamation point” as was seen in the previous patient. However, the variability of the GB position means that many patients have a PV that is partially in long axis when the GB is in long axis. It doesn’t matter. Focus on the PV and rotate the probe toward 11:00 - 12:00 to optimize the bile duct just anterior to the PV. Check color flow or power Doppler to see signal in the PV and IVC but no flow in the bile duct. This particular location at the termination of the GB is intermediate between the earlier distal CBD view in the epigastrium and the previous HD view as part of the PV jumping over the IVC. It can be important to see both proximal and distal bile ducts. Here is an image taken at the termination of the GB (no longer in view) showing the CBD anterior to the PV but more parallel to the IVC long axis. Contracted GB versus duodenum: Since most clinic patients have not fasted for six hours, contracted GBs are common and the duodenum can be mistaken for the GB. The next clip shows a parasagittal view of the right liver lobe and there is a structure at the inferior surface of the liver that a novice could mistake for a GB filled with stones, because of a periodic posterior shadow. However, notice that the outer wall of this structure is HYPOECHOIC and any shadow seen is “dirty”. This is the duodenum. Of interest, notice the long-axis PV that comes into view on top of a partially long-axis IVC. This extra-hepatic PV is not very hyperechoic in this patient. In contrast, here is a contracted, otherwise normal GB, showing a HYPERECHOIC outer wall, distinguishing it from the duodenum. In a contracted GB, the three-layer wall with a hypoechoic middle layer does not represent edema in the wall. Do not measure the wall thickness on a contracted GB (notice it was mistakenly measured in this image). The rest of the right liver lobe: After finishing the GB and bile duct exam, continue sliding transversely under the rest of the right costal margin, fanning anterior and posterior. Past the mid-clavicular line, the kidney should appear posteriorly. If the liver is large, it would extend below the kidney. The following is a transverse view of normal liver and kidney. This can be an excellent view for assessing the echogenicity of the liver next to the cortex of the kidney. Fanning further caudad can determine if liver extends beyond the kidney. Obese patients and patients with bowel gas may have impaired epigastric and subcostal views even with lateral positioning and inspiration holding. When this occurs, abandon the subcostal approach and use the intercostal spaces. The following anatomy image shows the intercostal spaces that are open caudad of the lungs but still cephalad of where intestines cause trouble. The most posterior spaces are oblique only and end at the lateral right costal margin while the next several anterior spaces start oblique and then curve horizontally before ending at the medial right costal margin. The following anatomy image, taken from the examiner’s perspective with a left lateral decubitus patient position, shows how the GB usually lies. The GB may be seen through the liver from the posterior intercostal spaces, but the GB view should improve in the more anterior intercostal spaces. Deep inspiration is NOT an advantage with the intercostal approach because lung should be kept out of the lower intercostal spaces. Have the patient breathe quietly. Begin at the caudal end of the most posteriorly palpated intercostal space where the right kidney is usually seen. Slide the probe obliquely cephalad in the intercostal space until lung appears, fanning side to side during which some lateral right liver lobe may be seen. Then, move anteriorly one interspace and slide caudad through that interspace until bowel is reached, fanning during this sweep. In this interspace the kidney and liver are usually seen together as in the next image. Notice that the echogenicity of the liver is greater than the kidney parenchyma in this patient, indicating likely steatosis that will be discussed in the next chapter. Continue the cephalad-caudad movement through the next more anterior intercostal spaces, but each of these will curve toward the medial right costal margin. Even in the posterior interspaces the GB, PV, and IVC may start to appear with anterior fanning, but closer views are usually possible in the more anterior interspaces. Here is a first view of the GB and PV from a posterior interspace. Magnification even showed a bile duct anterior to the portal vein. 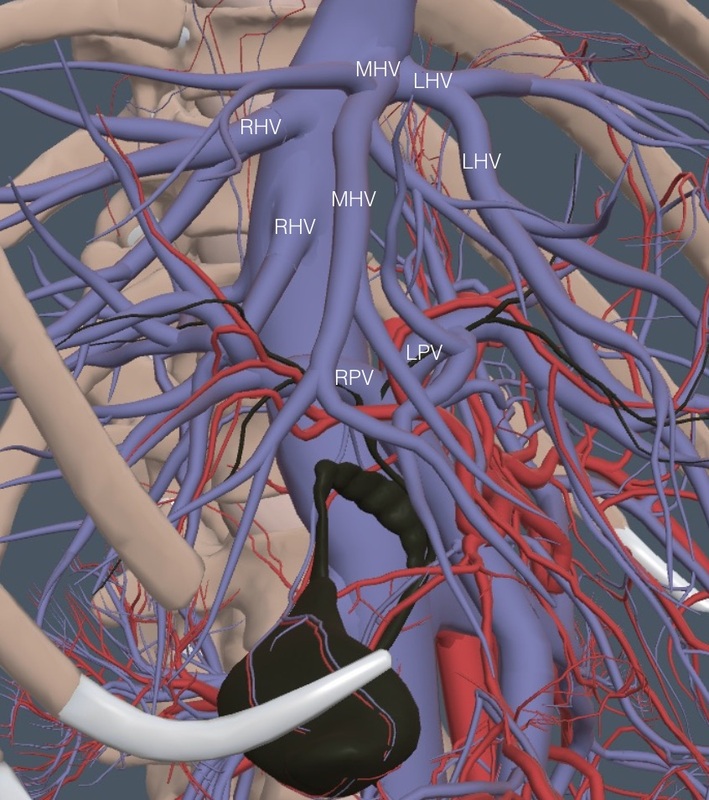 The relationship of the IVC, PV, and bile duct is maintained in all of the intercostal views. After a general survey of the four intercostal spaces to view liver parenchyma and HV, the best location to see the PV and GB is usually obvious. Go there and view the GB in short and long axis. Then, focus on the PV and rotate it towards long axis. Rib shadow will usually be in the image. The bile duct will be anterior to the PV and subtle rotation can optimize the bile duct view. Here is an intercostal view of the GB, PV, and IVC with bile duct well seen anterior to the PV. The relationship of the IVC, PV, and CBD should be consistent from patient to patient in this view, but the GB position may vary. The best view of the GB may be a poor view for the PV and CBD. The process for seeing bile ducts is the same any place in the liver region: find a PV anterior to the IVC, rotate the probe to bring the PV and IVC toward long axis and watch for the bile duct to appear anterior to the PV. Optimization of the duct usually occurs when the IVC is closer to long axis.